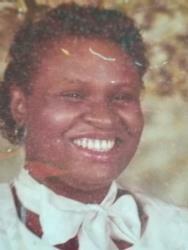 DREW - Angela Jean Drew, a resident of Jacksonville, Florida passed away on January 7, 2019. Funeral Service will be held on Thursday, January 17, 2019 at 11AM at the MIXON TOWN CHAPEL of Q. L. Douglas Funeral Home, 2403 Edison Ave. Mrs. Drew's remains will rest for visitation of family and friends on Wednesday, January 16, 2019 from 4-7 at the CHAPEL. My Auntie Ann My Baby My World you were everything and more to us , I pray Heaven is everything you ever taught us and everything you ever dreamed about ! Ill always love you !! Rest In Peace my sister I will always love you and I will never forget you.I will meet you someday again. I thank God that you have made your peace with God. Sleep in peace in Heaven.